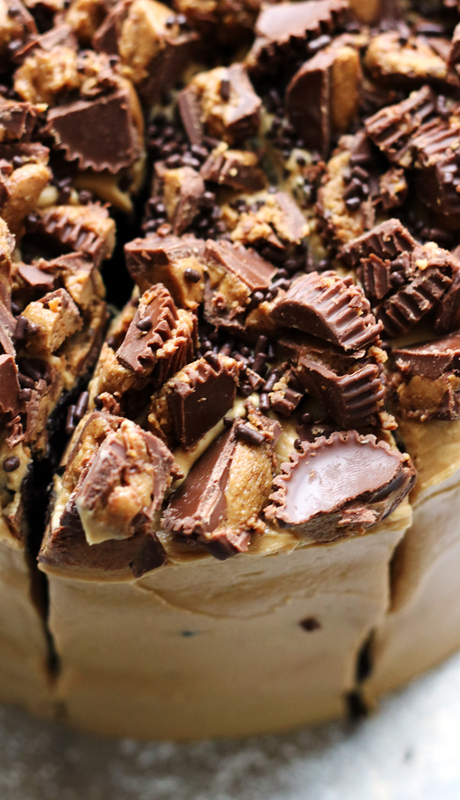 A decadent triple layer dark chocolate cake filled with a light whipped peanut butter frosting. Hands down, the most shocking thing of 2017 to me (and, let’s be honest…there is a lot to be shocked about in these times we live in) is that I never shared this cake with you. Better rectify that ASAP before the food blogger police come calling. 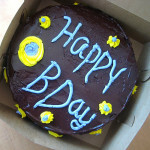 Thinking back, I’m 90% sure I made this for the.boy’s birthday last year, which is in March. So we’re not technically at a year out yet. 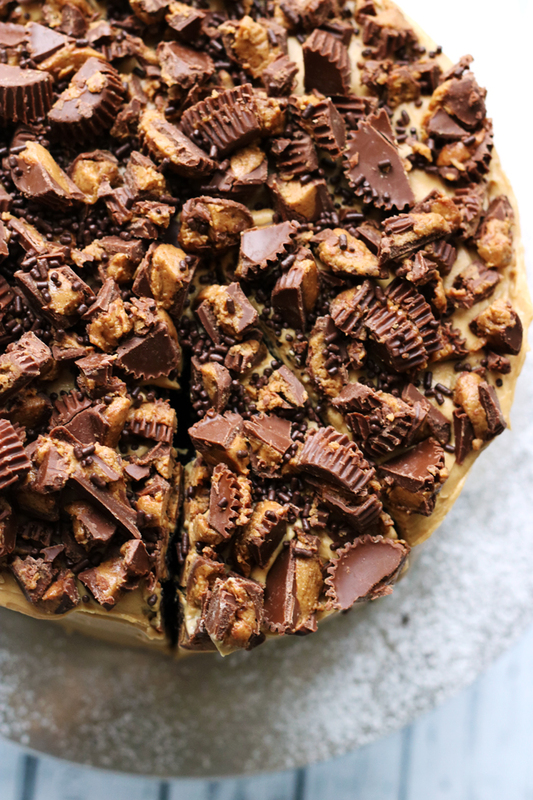 If you have a peanut butter and chocolate lover in your life, then you also happen to have a totally legit excuse to make this cake. It’s suitable for any occasion, including but not limited to “all days that end in y”. So, TODAY. Let’s do it. 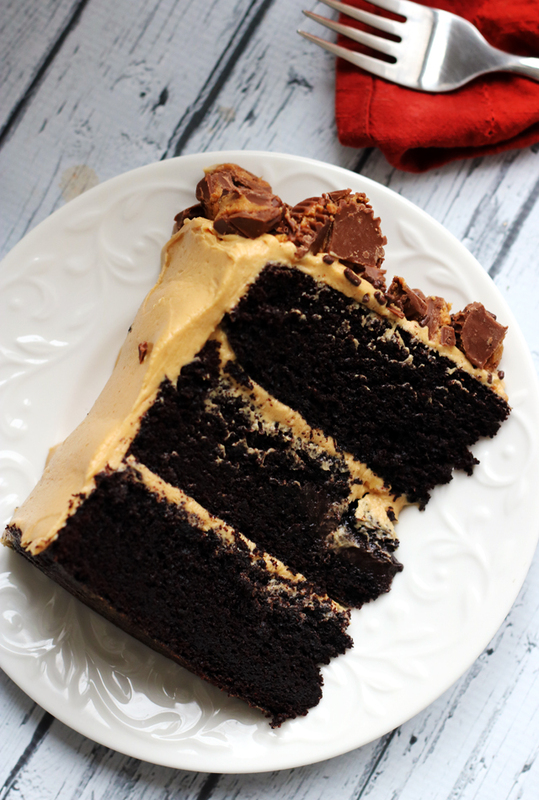 The cake part is dense and dark and sultry while the frosting is all lightness and air and peanut butter, but still rich and delicious. 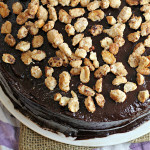 The original recipe is from one of my favorite blogs, Everyday Annie. 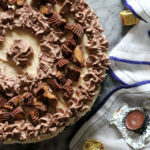 Annie loves fabulous desserts as much as I do, so I know that when she posts something, it’s basically her way of saying MAKE THIS NOW, it’ll be worth it. Suffice it to say, she was very right. Take notice. Heat oven to 350F. Grease 3 8-inch round cake pans with baking spray and line with parchment paper. Grease again and set aside. In a medium bowl, whisk together the cocoa powder, espresso powder, and boiling water until smooth. Set aside to cool slightly. Once it is lukewarm, stir in the sour cream and vanilla. Set aside. In the bowl of a stand mixer fitted with the paddle attachment, cream together the butter and sugar, beating on medium-high speed for 4-5 minutes or until fluffy. Add in the eggs one at a time, mixing well after each addition. Scrape down the sides of the bowl as needed. Turn the mixer to low and add the flour mixture in three additions, alternating with the cocoa powder-sour cream mixture, mixing each time until just incorporated. Divide the batter evenly between the prepared baking pans. Place in the preheated oven and bake for 30-32 minutes or until a toothpick inserted in the center comes out clean, rotating the pans halfway through baking. Place pans on a wire rack and allow to cool for 30 minutes in the pan before inverting onto the rack to cool completely. Combine the heavy cream and ¼ cup of the powdered sugar in the bowl of a stand mixer fitted with the whisk attachment. 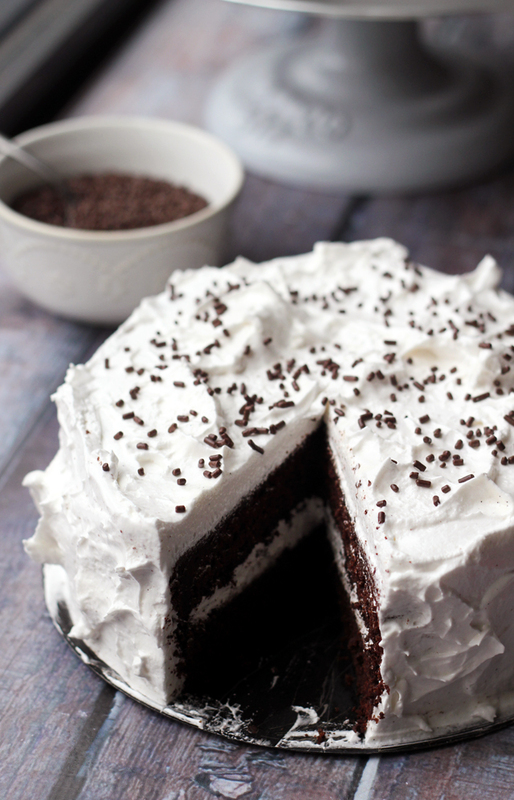 Whip until stiff peaks form, but make sure not to overmix - the whipped cream should still be light and fluffy. Transfer to a separate bowl. Replace the whisk attachment with the paddle attachment and add the butter and peanut butter to the bowl of the stand mixer. Beat on medium-high speed for 45 seconds, or until smooth. Add the remaining powdered sugar to the bowl. Mix on low at first and then gradually increase the mixer speed to high as the sugar becomes incorporated. Mix in the vanilla and salt, then beat on medium-high speed for 4-5 minutes, or until fluffy. 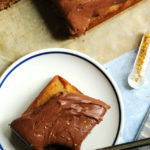 Using a spatula, gently fold about a third of the whipped cream into the peanut butter frosting, then fold in the remaining whipped cream, mixing until well combined and no streaks remain. 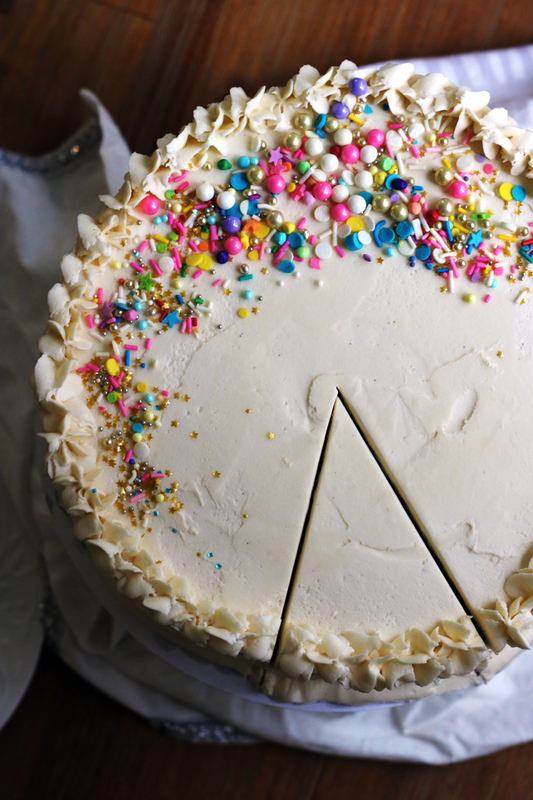 To frost and fill the cake, place one of the cake layers on a cardboard round or serving platter. Spread about 1 cup of the frosting on top of the cake. Top with a second cake layer and then add another layer of frosting. Top with the third cake layer and then frost the whole cake with a very thin layer of frosting for the crumb coat. Place the cake in the freezer for about 30 minutes to allow the frosting to set. Once the cake is set, frost the top and sides of the cake with the remaining frosting, reserving about 1 cup of it for further garnishing. 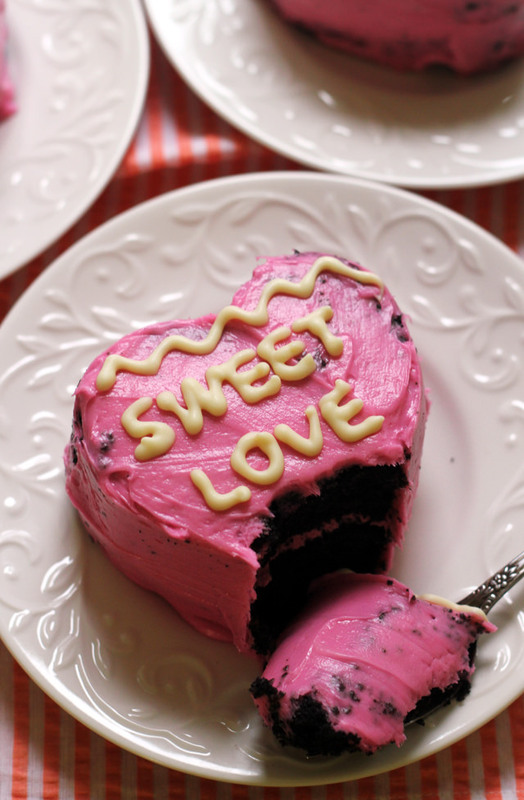 Add the reserved frosting to a piping bag and decorate the cake as desired. 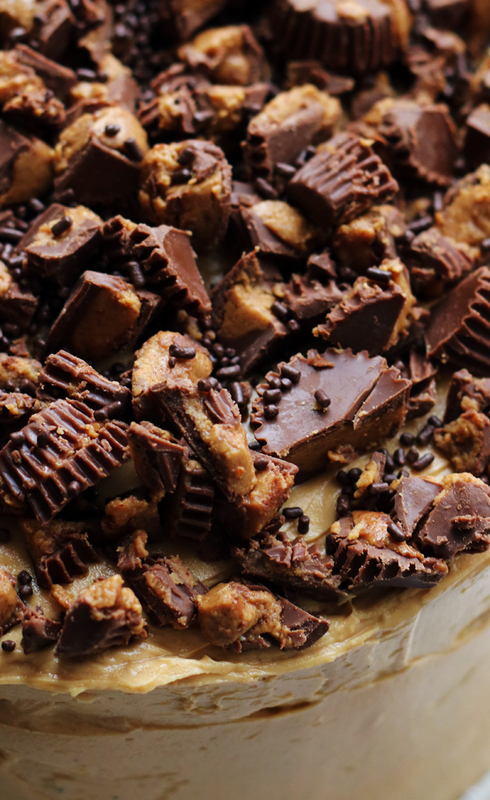 Top with peanut butter cups and enjoy! I’m totally doing the eating healthy thing and you are KILLING me! Oh my. Totally swoon worthy. I have a few family members who would LOVE this cake. Jo Anne, How do you do It? It’s been several years since I visited your blog and I can’t believe you are able to post every several days, while going to med school and studying for your Ph.D! Plus, you are still posting such delicious recipes! 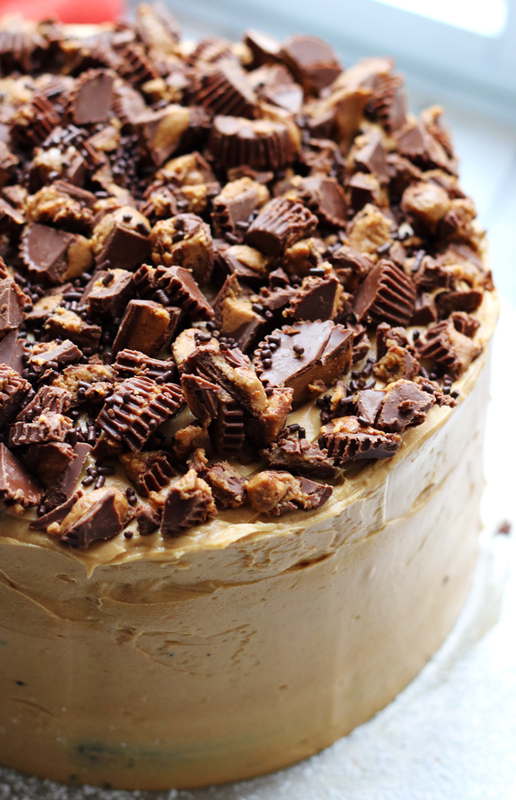 this is my dream cake!